Last week I had the pleasure of celebrating my birthday with friends Teri and Anna at one of our favorite spots, Camino Bakery. I had no idea that Camino often does wine tastings on Wednesday nights, so it was a serendipitous surprise when I saw the tasting set up. (I mean, I just figured it was a birthday present to me…) After we had chit chatted for awhile and drank what we had ordered, the two of us who are not 8.5 months pregnant (sorry, Anna!) got down to the business of tasting some new-to-us wines. 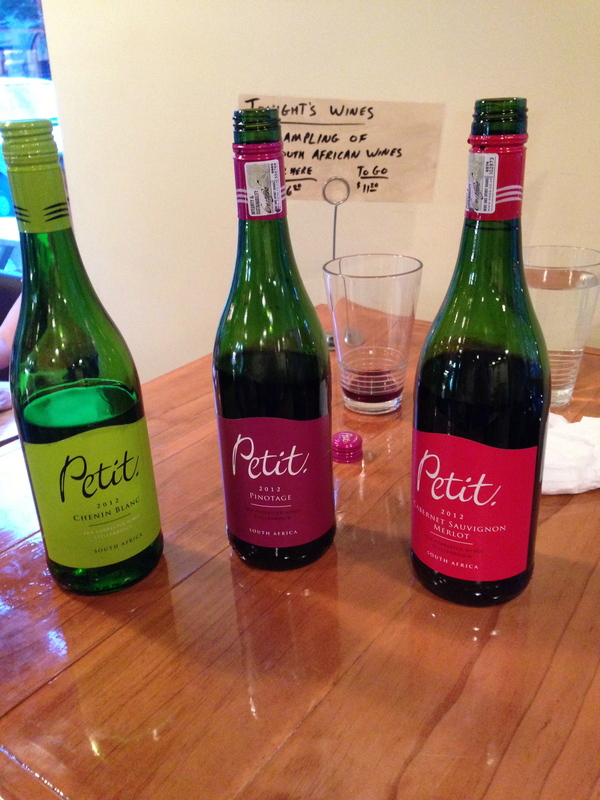 The wines were 3 different varieties from South Africa, from the Ken Forrester Vineyards “Petit” range. They were a Chenin Blanc, a Pinotage and a Cabernet Sauvignon / Merlot blend. I really loved all 3 wines, but I nearly did a little jig when I was in the wine section of Fresh Market today and saw the Chenin Blanc. I had made a few notes of each of the wines to post a review, but I was thrilled to be able to pick up a bottle and do a more “official” tasting in the comfort of my own home. (Read: drink more than a few sips.) Hopefully I can track down the Pinotage, which was my true favorite of the three, to review as well! 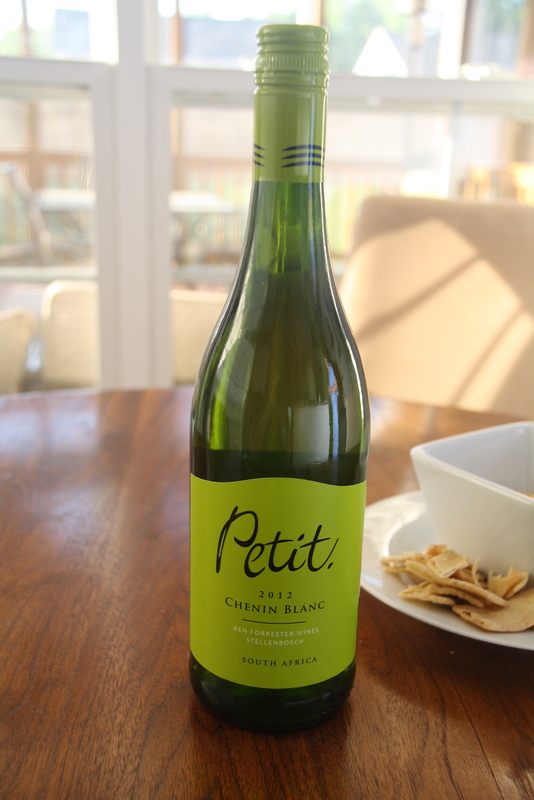 The Chenin Blanc is a perfect summertime meal wine. It’s crisp and refreshing, but has a little bit of a bite to it being a wine with a higher alcohol content. (13.5%… you’ve been warned!) It’s almost got a little bit of effervescence to it and a very fresh, herbaceous taste to it. It’s not overtly fruity, but reminded me a little of a crispy Granny Smith apple. 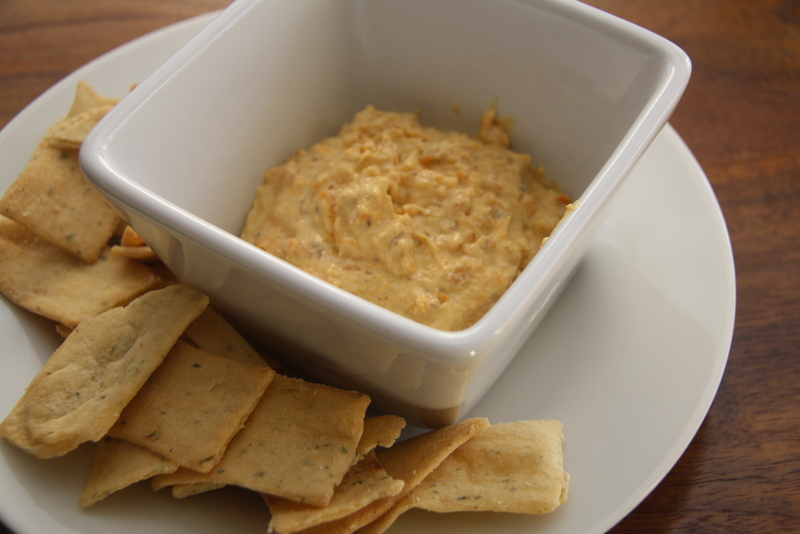 We had it first with a roasted pepper goat cheese spread (recipe below) and then with tuna steaks. I think it stood up to the meal nicely, and I most definitely see it becoming part of our regular summer rotation. Aaaaand now I’ve added South Africa on my wine-travel bucket list. Would you buy again? Absolutely! I adapted this recipe from one I had found awhile ago, and I can’t for the life of me find the original. If I do, I’ll add the link back in because I certainly didn’t create this recipe on my own. (If you find it / have it, please share.) This was made on a whim because I was trying to find a way to use up a bell pepper, and we literally were using pita chips to scrape the food processor clean to get every last bite. Coarse chop the almonds in a food processor. Add the rest of the ingredients and blend to a semi-even consistency. Serve with pita chips. those wines were great! I need to remember to grab a bottle!